Vaping was introduced about a decade ago as an alternative to cigarettes for adults who were trying to quit smoking. The battery operated devices used to vape heat up a flavored nicotine liquid into a vapor that can be inhaled. The most recent popular product that Valley school officials have seen students use is the Juul, a small device that looks much like a USB drive, but contains the same amount of nicotine as a pack of cigarettes. 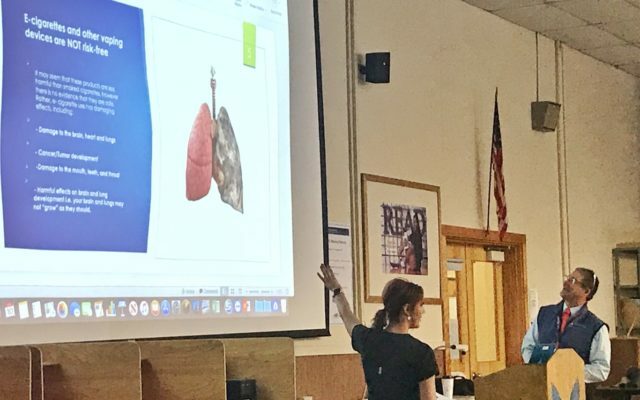 Jennifer Malmborg, a registered nurse and behavioral health/substance use case manager, and Doug Levesque, a licensed clinical social worker, gave a short presentation about the dangers of vaping that young students might not have otherwise understood. According to data from the federal Centers for Disease Control and Prevention, about 21 percent of high school students nationwide reported using e-cigarettes in 2018, representing a huge increase from about 12 percent the previous year. In Maine, 15 percent of high school students reported using e-cigarettes in a 2017 survey. “One in six high school students have used in the last 30 days,” Levesque said. Since last year, Maine law prohibits anyone under the age of 21 possessing, using, selling or distributing any nicotine or tobacco products, including e-cigarettes. Part of the reason for the legislative change was to make it more difficult for high school students and potential smokers to obtain tobacco or e-cigarettes from their 18-20-year-old friends who could buy them. Anyone who turned 18 by July 1, 2018, however, is grandfathered under the new law and still able to by tobacco products and e-cigarettes. 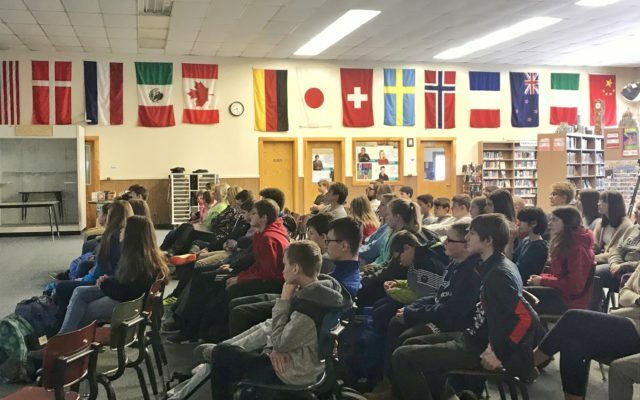 Maine lawmakers also have introduced bills this session to restrict the marketing of e-cigarettes to both children and adults, and to ban the possession and use of electronic smoking devices on school grounds by both students and staff statewide. One of the health risks associated with vaping involves a condition called popcorn lung, which damages the lungs’ smallest bronchial airways and makes the sufferer cough and feel short of breath. “[Popcorn lung] is one of the most popular internet searches around vaping,” Malmborg said, adding that the chemicals released are done in an aerosol fashion, much like the aerosols found in hairspray. The trouble many parents and school officials face is the marketing techniques used by companies like Juul to promote the sweet flavored liquids to be inhaled. Flavors like cotton candy, bubblegum, and creme brulee entice younger students to use the products, many of which contain nicotine. Even if they don’t have any nicotine, vaping liquids can contain other hazardous substances — including some labeled by the U.S. Food and Drug Administration as safe to eat, though not safe to inhale.